Checker and chess are almost same game. Both of them use the same board with same squares amount. The chess and checker pieces are put on black and white squares of board. The only different of chess and checker game is their pieces and rules. Chess pieces has various kind of designs and looks more varied and creative. While, checker pieces are in same shapes, round and not too thick. In the picture above is one of our checker set product. Carved and designed in big size, so that they looks gallant and heavy. But, those pieces are not too heavy. They made of best quality of Teak wood and carved carefully by craftsman. 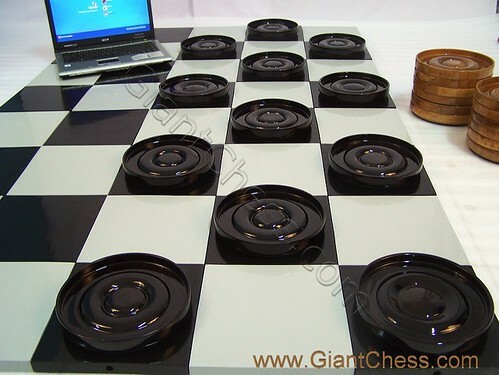 Supported by wooden checker board, make it perfect for outdoor game. Those product are durable for outdoor game, so you can use it at garden, beach, camp, villa and another outdoor space.